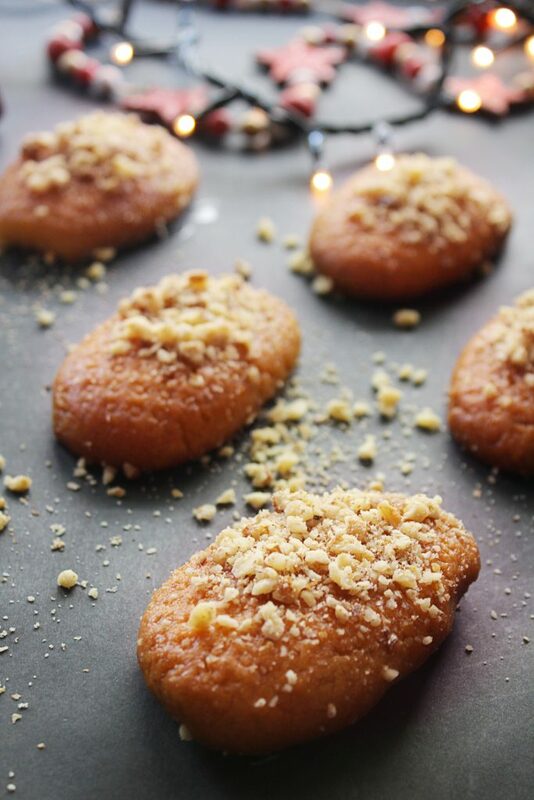 Moist Christmas honey cookies, tasting like cake with so many tasty layers and flavor complexity that arises from different spices, orange and delicious, sweet, gold honey. So simple to make but extremely flavor compact. Although this recipe is based on pure olive oil, honey is the star. These cookies are bathed in a honey syrup which makes them so soft, delightfully melting in your mouth that it is impossible to eat only one. Really! 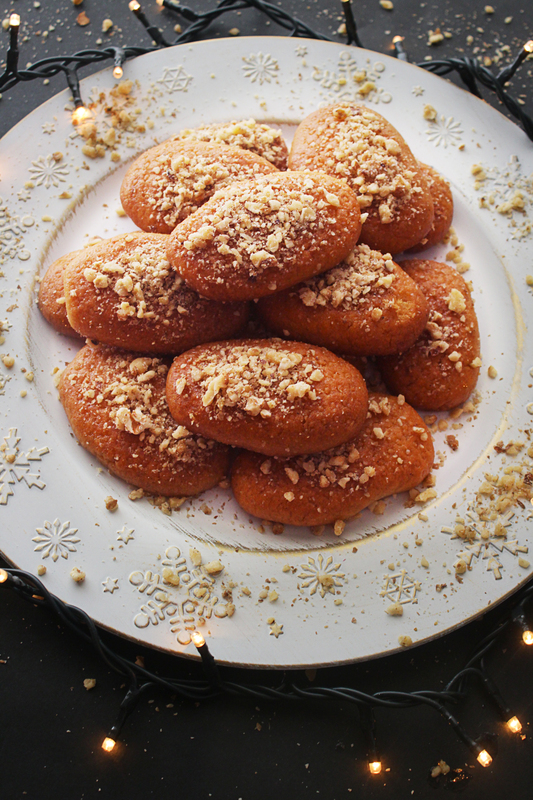 In the end, they are garnished with chopped walnuts. 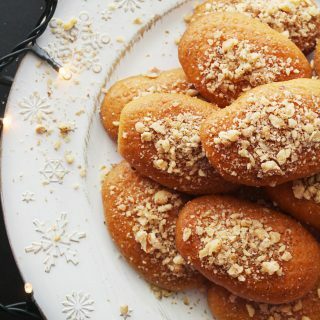 Not surprisingly that these cookies are all time favorite for Christmas in Greece. 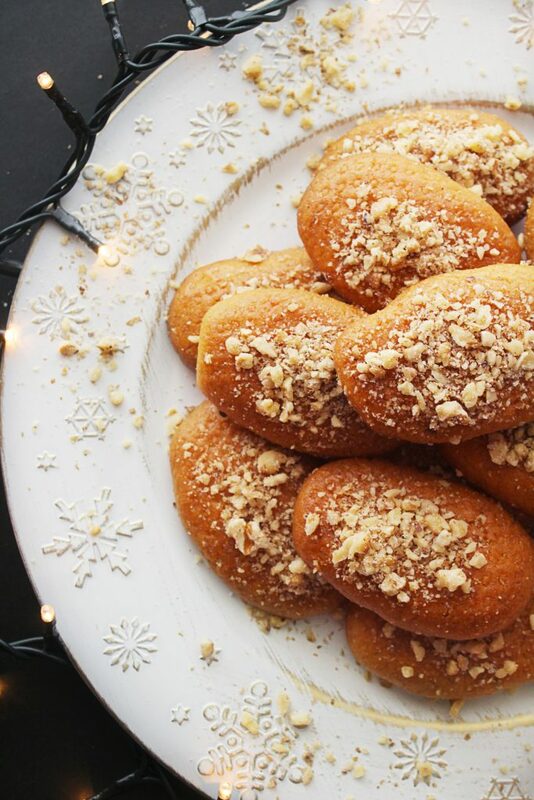 Along with kourabiedes (Christmas butter cookies) and diples (honey rolls), melomakarona is the traditional sweets in almost every Greek home. The roots of these desserts lie deep in the centuries, lost in the culinary history of the Mediterranean Basin, in the eating habits of ancient Greeks, Romans and the Islamic culture that influenced and transformed every single regional cuisine. These honey cookies for instance: Melomakarona = “Melo” from honey and “makarona” coming from macaroni which is –guess what? – Right! Greek! Macaroni derives from the word «μακαρωνία», a funeral dinner where a pie called «μακαρία» was served. Later on, they had the brilliant idea to add honey in that pie and that’s how melomakarona was born. But why Christmas honey cookies? It is simple. Honey symbolizes fertility and well-being for the new year to come. Enough with memories and let’s wait no more. I am excited to share my family’s recipe and all the “behind the recipe secrets”, and techniques. Because I really want your Christmas honey cookies to be the most popular treat all over your town or just to make your home smell like Christmas. Description: Take the liquid ingredients and mix them with flour. Shape the dough and bake it. Let the cookies cool and make the syrup. Bath the cookies in the hot syrup. Garnish with walnuts. Boom. Christmas honey cookies, ready. Don’t freak out about sugar. You may replace it. I won’t. I don’t want to change anything from my family’s recipe out of respect for my grandma and because it is so incredibly awesome like this. Come on, it’s Christmas, guys. Enjoy your Christmas cookies without guilt. 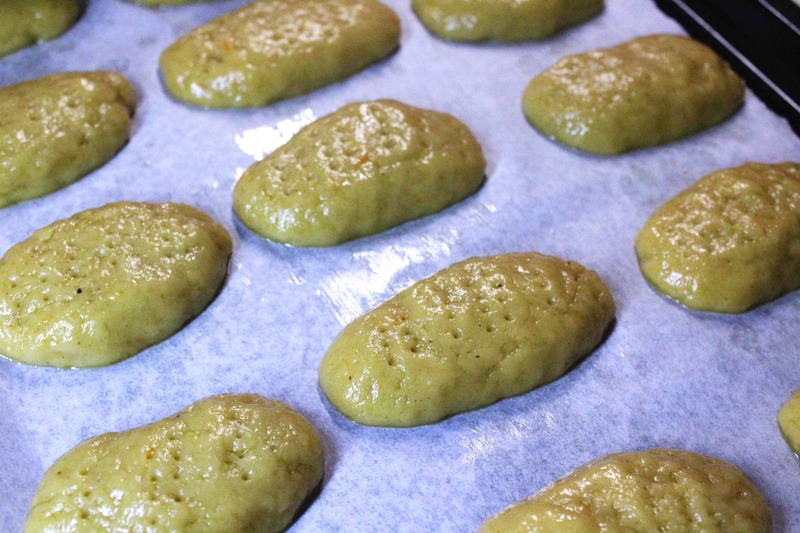 However, these cookies have olive oil, honey, orange juice, walnuts and offer tons of antioxidants. Your body will thank you for it!! Listen to my grandma. Stir gently and knead without overworking the dough. No more than 2 minutes from the moment you incorporate the flour. There isn’t a right quantity of flour. 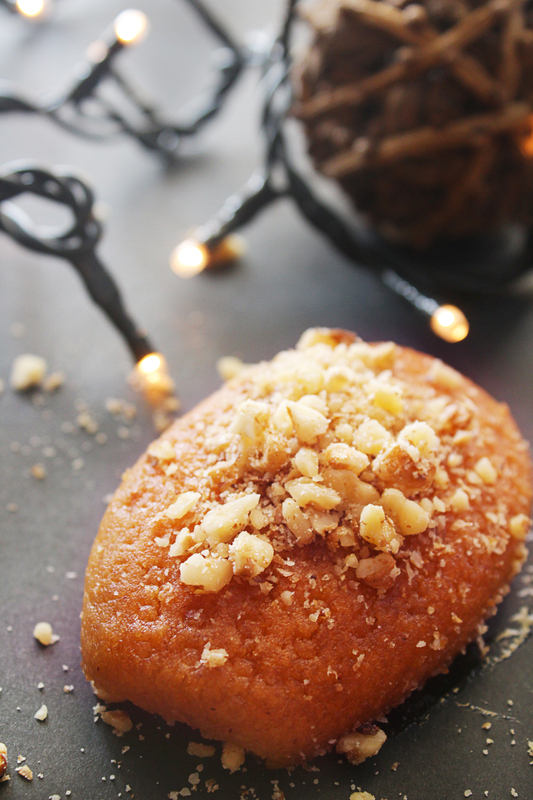 Greek home bakers usually add flour “as much as it takes”. Well, I know this is not very helpful but my tip will be. Add the flour gradually and check the dough. I have estimated more or less 8 cups (1kg) of flour for that recipe. Add 6 cups and shape one cookie. Let it rest for a couple of minutes. If it keeps its shape and doesn’t melt, you are good to go. Otherwise, incorporate more flour and check again. The cookies should be cold in order to take a hot syrup bath. You may prepare the cookies the day before. There are of course other ways to add syrup but this one is more convenient because you can adjust the quantity yourself and make your cookies as sweet and soft as you like. The traditional shape is oval and their size is more or less the size of a palm. You may like the traditional decoration on their surface by using a fork. Pinch lightly only the surface. Another way is to press lightly the cookies on a cheese grater. This technique will help the cookies to soak better the syrup. If you know what I mean!! Enjoy your Christmas honey cookies with a hot cup of coffee or herbal tea. For about 40 cookies (the number depends on their size). Preheat the oven at 200°C / 390°F. In a big bowl, add olive oil, sugar, orange, orange zest, cognac/brandy, sugar, clove powder, cinnamon powder. Whisk well for 1-2 minutes to dissolve sugar. In another smaller bowl, sift the flour with the baking powder and baking soda and add the flour mixture to the liquid mixture. Use a spoon and gradually incorporate the flour. After 6 cups of flour, the dough is too firm to stir with the spoon. Use your hands to gently fold the dough from the bottom to the top. Knead for no more than 2 minutes. Add gradually the rest of the flour and check your dough. Shape one cookie and let it rest for a couple of minutes. If it holds its shape, the dough is ready. Line a baking sheet/pan with parchment paper (optional because they won’t stick anyway), shape the cookies in any form you like and place them leaving some distance between them. Pinch their surface with a fork. Place the pan in the middle rack of the oven and bake for 20-30 minutes. Repeat the procedure from another one or two batches. Let them cool. Prepare the syrup. In a saucepan add water, sugar, cinnamon stick on medium-high heat. Boil for 5 minutes and remove from heat. Add honey and whisk until it dissolves. Remove cinnamon stick. Dip the cookies into the syrup with a slotted spoon for 5-10 minutes. The time depends on how sweet and soft you want them. Test the first one and adjust accordingly for the rest of them. Then dip them in batches, rotate them and remove them. 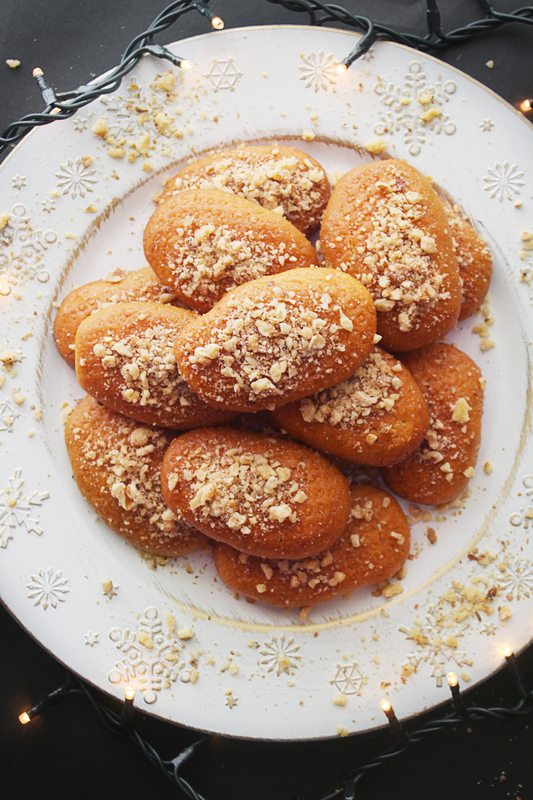 Place them on a large platter and immediately sprinkle chopped walnuts. You don’t have to keep them in the fridge and if you don’t eat them in a few days (yeah, right!! ), they will last during all Christmas holidays.